Augmented Reality (AR) is one of the learning tool which can be used as a medium to produce interactive teaching and learning (T&L) process, in order to assist students in grasping the knowledge. Due to these, Centre for Research and Development of IoT (CREDIT) take an opportunity to organize workshop on Augmented Reality for Educational Purposes, conducted by Dr.Fariza Khalid, a lecturer from Faculty of Education Universiti Kebangsaan Malaysia (UKM). 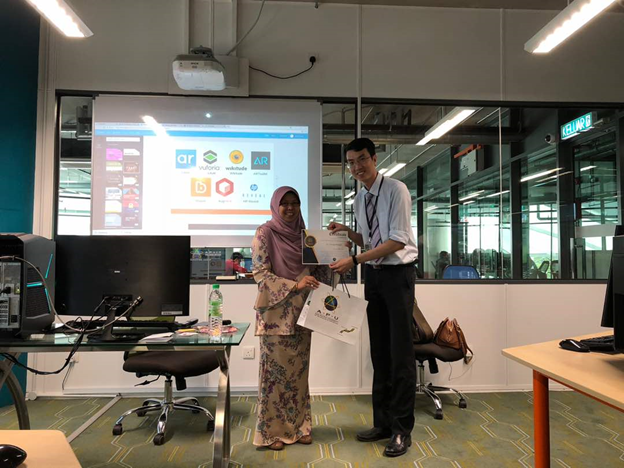 The workshop is aim to relate the theories and practice among the lecturers in using AR as a medium to enhance the T&L process. 20 lecturers were involved in the workshop which conducted on 28th August 2018 (10.35 am – 12.35 pm) at Lab4-02.